That’s the question that politicians and journalists across the EU are asking themselves. Jean-Marc Ayrault was especially frank, stating he thought Johnson was a liar. Frans Timmermans can barely hold back his disgust. Frank-Walter Steinmeier, in measured and serious tones, nevertheless conveyed a lack of comprehension with what was going on in the UK. 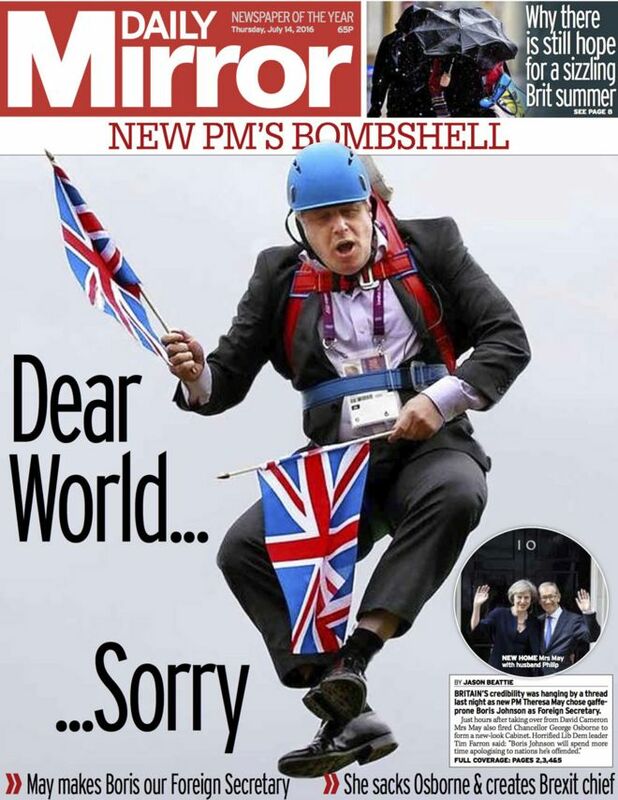 The UK’s Daily Mirror, conscious of this sort of reaction, carried the headline “Dear World… Sorry” today. But I think that all of this in the UK ought to come as rather little surprise. The UK’s EU referendum itself was fought in a frivolous manner – Boris Johnson’s heart wasn’t really in it for Brexit (his reflection was for his personal future), nor was Gove’s (judging by his behaviour on referendum night), while in the meantime Corbyn has been more active protecting himself from challenges in his party than he was doing anything worthwhile in the referendum campaign to keep Britain in the EU. Simon Kuper called it all a coup of one set of public schoolboys against another. The Leave campaigners were playing with the future of the UK – something that itself was incomprehensible to the political classes in the rest of the EU – so why should it be any different now, after the referendum? If you doubt this have a look at the Daily Mail that’s giving the impression that all is fine and dandy after Brexit, while the what-the-hell-are-the-Brits-doing is the preserve of the left or internationally orientated media like the FT and The Economist. As I blogged yesterday, giving Johnson the task of delivering Brexit could be a stroke of genius – in the medium term, and if you see British politics as a game. Give 4 prominent Brexiteers – Johnson, Davis, Fox, Leadsom – the task of actually delivering on their promises, and see how they fare. But the likes of Ayrault, Steinmeier and Timmermans simply do not see it that way. This is serious, now, so, UK, be serious. Don’t ask the arsonist to put out the fire. Plus as @kuramanga pointed out on Twitter yesterday, this superficial approach is causing pain in the UK now. But the UK political class is not stopping playing. The reaction of Juncker, Tusk, Rutte and Schulz should also be seen in this context – we will respect the UK vote, if the UK respects the EU’s exit process (Article 50). But the UK has still not triggered Article 50, claiming it needs a pause to get its Brexit position together – because UK government did not pay enough attention to these details before the EU referendum (because they were all too busy playing the referendum campaign and lie about the £350m game). So, in conclusion, do not expect any serious from the UK in the coming weeks and months. The UK has not played a serious and honest game within the EU until now, so it is unrealistic to expect its politicians to approach exit in an any more adult manner. It’s the continuation of the classic lessons from Yes Minister.